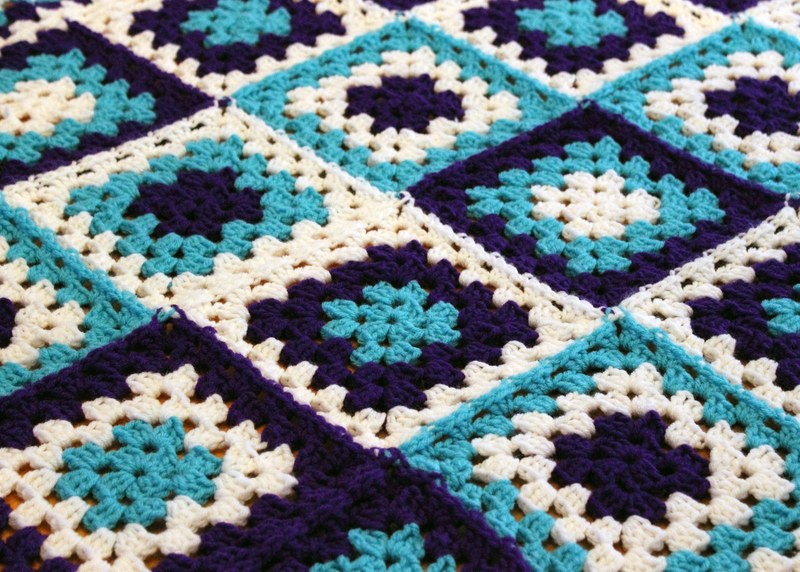 Grandbaby Granny Square Blanket | Goats and Hounds! First of all, I have to apologize for the colors in these photos. The colors I used are purple, turquoise and white. However, it was snowing and I had a heck of a time getting adequate lighting. Of course, I’m impatient and wasn’t going to wait another day to take pictures. I’m actually impressed that you aren’t seeing horrible photos that were taken in incandescent light – I finished the blanket the night before. The purple and turquoise yarn was part of my fantastic gift of yarn by the parents of this child. I was eager to get it finished and photographed so I could send them the pictures. It’s just your standard Red Heart Super Saver yarn. I found a pretty cool granny square generator – here. 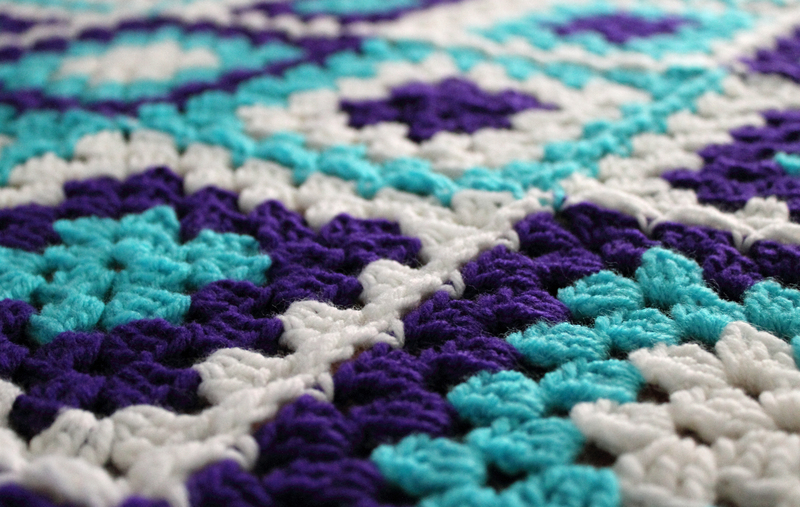 And used this to help me make the blanket look more random – because I completely lack imagination and would pretty much just make diagonal stripes or something. Yes, I’m truly that boring. 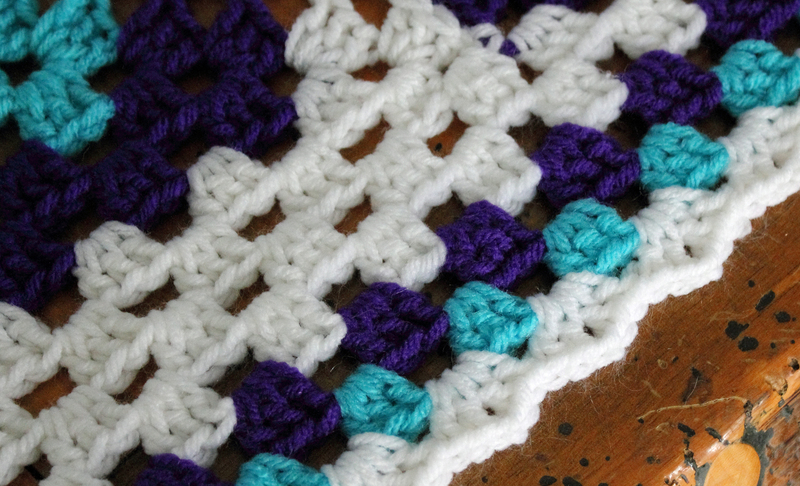 This is a very simple double-v-stitch edging that I think is pretty perfect for granny square blankets. I found it here. 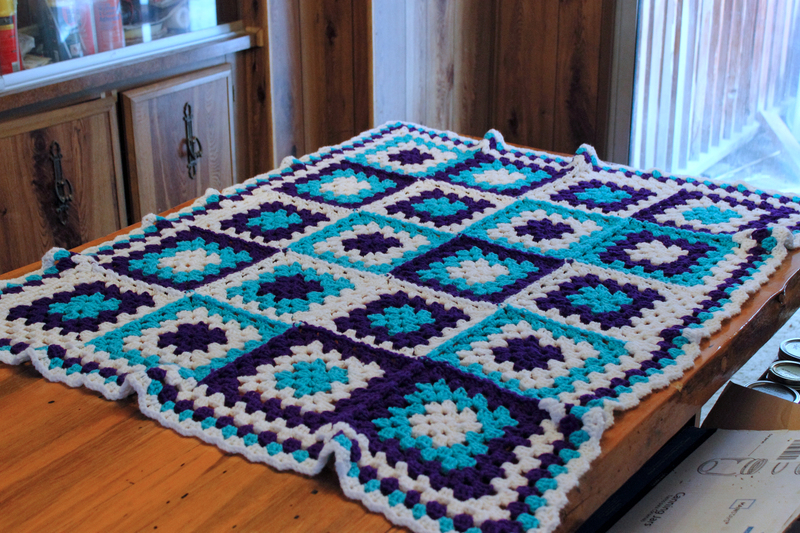 The blanket is just a simple square of two rounds per color. I used the join-as-you-go method for joining the squares. I had forgotten that I wanted to try the Celtic Lace Join – found here – for my next project that included squares. Ah well, maybe I’ll remember on the next blanket. Tah-dah! It took me about three days to finish. Mom and dad tell me that they love it. That makes me infinitely happy. By the way… See how it’s kind of ruffled? That was not on purpose. From what I understand, it has to do with how many clusters are put into the adjoining corners of the squares when doing the border. I don’t usually put borders on blankets, so I didn’t realize that this would happen. This entry was tagged Baby Blanket, Crochet, Grandbaby, Photos.